LG at CES 2018: 5 key highlights, from OLED TV to CLOi the AI robot | What Hi-Fi? 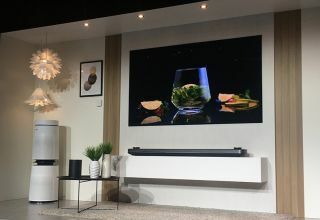 LG kicked-off CES 2018 with the announcement of new and improved 4K OLED TVs, even more HDR modes, and a new AI brand that connects every single LG product. There was no sign of the mammoth 88in 8K OLED TV that LG announced ahead of CES 2018, but we did get expected confirmation of a new 4K OLED TV range for 2018 with improved picture performance. The OLEDs will feature Ultra HD 4K resolution, Google Assistant voice control, high frame rates and plenty more HDR technology to add to the list. But the rest of LG's press conference was focused on its global artifical intelligence brand - ThinQ - and how it connects every single product in LG's portfolio, learns your habits, and delivers a smarter smart home experience to make your life better (in theory). The future is here, people. We'll be checking out this AI in action and seeing the brand new TVs in person over the coming days, but for now here are the highlights from LG's CES 2018 announcements. It’s a not a huge surprise that LG’s 2018 range of 4K OLED TVs claim to be better than last year’s TVs. The inclusion of LG’s new Alpha 9 processor in the 2018 OLED TV range promises to deliver 50% more powerful images and data processing than the 2017 models. Alongside 4K resolution, the new series of OLED TVs (W8, G8, E8, C8 and E8, screen sizes 55in to 77in) claim to offer better colours (731% more colour points than before), clarity and depth for more realistic and lifelike images. The TVs will also support HFR (high frame rates) up to 120fps (frames per second) for future-proofing next-gen content. LG AI OLED TV ThinQ – quite a mouthful, but it means 2018’s OLED TVs are part of the company’s ThinQ artificial intelligence umbrella brand. This aims to learn your habits the more you use the products. “I learn to know you” is the mildly creepy tagline. Google Assistant is also deeply integrated into the OLED TVs, meaning you can ask your TV to do all sorts of things: ask it to turn off after a programme, pull up a TV show’s cast, display your holiday photos and even order a pizza. And you can use your OLED television to control any other ThinQ-enabled LG products (smart fridge, air purifier, robot vacuum) you may have in your incredibly smart home. We really wish it hadn’t come to this, but 2018’s brought us even more variants of HDR. First, the good news: LG’s 2018 OLEDs will feature the standard HDR10 and HLG formats, along with Dolby Vision HDR and Advanced HDR by Technicolor (the latter used only by LG). Think that’s it for HDR? Thing again. Adding even more letters into an ever-growing list of confusing acronyms, LG has also announced HDR 10 Pro and HLG Pro modes. Standard HDR10 and HLG use static metadata (as opposed to dynamic metadata used by Dolby Vision). LG says this is bad, and wants to deliver better HDR images by using its own ‘dynamic tone mapping expertise’ – hence the Pro modes. We reckon these are simply additional processing modes in the TV menu, but we will find out more details from LG soon. It’s not all about OLED. LG’s LCD TV range – which uses Nano Cell Display technology – has also been enhanced. The SK95, SK85 and SK80 models use an Alpha 7 picture processor (slightly less powerful than the flagship OLEDs, and it doesn't support Google Assistant). The 4K LCD TVs feature full array LED backlighting with local dimming, which promises enhanced black levels and contrast (crucial for HDR, says LG). The TVs also claim to deliver better off-axis viewing (one of the banes of an LCD telly), with LG claiming you can see 99% of the colour accuracy when viewed 60-degrees off-axis. Alexa, Siri, Cortana, Google Assistant and Bixby have a new AI playmate: CLOi. Bearing more than a passing resemblance to Eve from Pixar’s Wall-E, CLOi is the personality behind the ThinQ smart home products (but not, as far as we can tell, for TVs). A smart speaker with the CLOi voice assistant built-in was teased, although LG’s current smart speaker line-up features Google Assistant. You can ask CLOi to do everything in the house, although she did act up during the press conference demo, with LG’s spokesperson claiming “even robots have bad days”. Maybe give her a break every now and then.